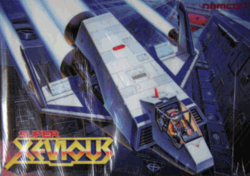 Super Xevious is not a sequel of Xevious. It is an update of the original version, making it more difficult and adding a new set of enemies to the mix. It was the last game from Namco to use a Zilog Z80 microprocessor (in fact, like the original, it used three, running at 3.072 MHz). The game is not to be confused with Vs. Super Xevious, which is a sequel game that was built upon the NES/Famicom-based arcade architecture. Due to the tremendous popularity of Xevious, players eventually mastered it and learned how to play for longer periods of time. Since Xevious does not have an ending and the game plays continuously, expert players aspired to the challenge of reaching the highest score possible in the fastest amount of time. This still took a considerable amount of time, and arcade operators were seeing less money coming in from the machine as players took longer turns. In order to entice arcade owners, Namco created Super Xevious as an update of the original that promised to generate profits again by providing an increased challenge. Super Xevious increases the overall difficulty of Xevious (which many consider to be quite difficult to begin with) by enhancing the aggressiveness of the enemy aircraft. Because it was known that high scores were a highly sought-after goal, some of the new enemies introduced in Super Xevious actually reset the score to 0, if they are destroyed. This changes the mind-set of the game from "destroy everything in sight" to being more judicial about what you shoot at. In the case of the tank, you are meant to fly over it and pick it up in order to be awarded a 10000-point bonus. Additionally, some scorings were changed; Sol Tower discoveries and destruction has been reduced from 2000 to 1000, while destroying the Brag Sparios has been increased from 500 to 2000. In true Namco fashion, the flagship of the Galaxian army makes an appearance in Super Xevious, though with a considerably different color scheme. Galaxians come alone, or in waves, and dive bomb straight down the screen, firing at you along the way. Although present only in Super Xevious, the sprite for this and a silver Galaga scorpion has been found in the original Xevious. Along the way through area eight, you will come upon an idle tank. Bombing it will reset your score back to 0. Instead, you are meant to pick it up and earn a hefty bonus of 10,000 points. The tank's design is similar to those of Namco's Tank Battalion (1980). Towards the end of area ten, you will cross the air strip, where an unusual plane can be seen taking off the run way. It is vulnerable to your zapper, and if it gets shot, your score will be reset to 0. Shortly after the second mothership encounter in area fourteen, a helicopter can be seen sitting idle. Destroying it will likewise destroy your score, so let it be. This is the only "earth" craft that is both indestructible and can pose a direct threat to you. Towards the middle of the area fifteen, it streaks across the sky. It cannot be destroyed and it will kill you if it makes contact, so just let it fly by. This page was last edited on 26 October 2012, at 01:36.